Bodrum takes you to a haven of glorious sunshine, historic landmarks and unique Turkish charm alongside picturesque scenery and stylish shopping. It’s a perfect choice for families and couples holidaying on Turkey’s Aegean Coast. Enjoy exploring the medieval Crusader Castle, built by the knights of St John, before selecting from the array of waterfront restaurants looking out over the marina. It’s a favourite holiday hotspot for celebrities too, so you can look out for the rich and famous as you cruise around the pretty peninsula on a guilt. There are some stunning beaches in the Bodrum area of the Aegean Coast, perfect for some lazy days spent catching the warm rays on powdery golden sands lapped by warm turquoise waters. Bitez Beach and Gumbet Beach are popular choices thanks to their fine gold sand and a superb collection of water sports, including paragliding, wind surfing and banana boating. Holidays in Bodrum offer the best of both worlds, where swanky boutiques live alongside stunning architecture. 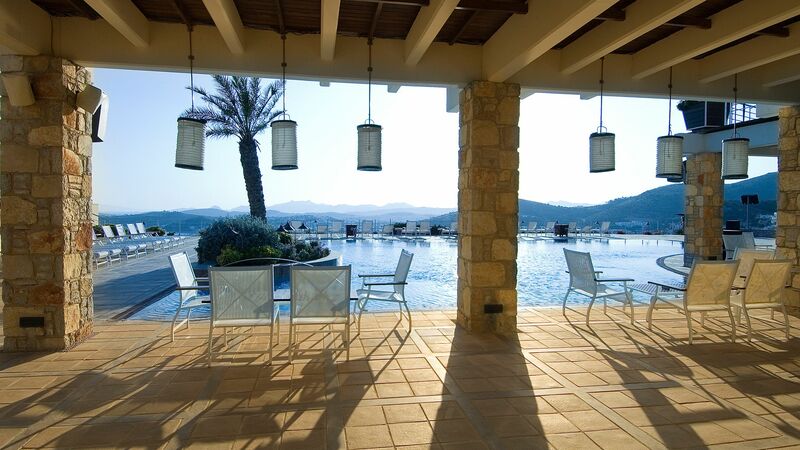 It’s one of the most cosmopolitan resorts on the Aegean Coast. Explore the covered bazaar of Kale Caddesi beneath the castle, where you can select a holiday souvenir from an impressive range of jewellery, beachwear and bargain leather goods. As night falls, choose from chic cocktail bars and eateries in the marina and seafront, or take a stroll through the lanes and pick from the quaint tavern style restaurants serving delicious Turkish specialities. Wherever you choose to stay in Turkey, Sovereign will tailor make a holiday to suit your needs, including flights, airport transfers and luxury accommodation tested by our team of experts. The Mamara Bodrum is a stunning choice. It’s perched on a hilltop overlooking the white washed, bustling city of Bodrum, and offers panoramic views of the Aegean Coast. Relax in contemporary accommodation before taking a dip in the large outdoor pool looking out to sea. Flight time from the UK is approximately four hours. Transfer time from Bodrum airport to Bodrum town is approximately 35 minutes. There are no two ways about it – Turkey is hot. Summers top 30°C, with an average of 12 hours of sunshine a day and virtually no rain. The coast is cooled by sea breezes, which are particularly welcome in the mid-summer months. Spring and autumn are good times to go, averaging a thoroughly beach-ready mid-20s with plenty of sunshine and blue skies. British citizens need a visa to enter Turkey. It costs 20 US dollars, and you can apply online at http://www.evisa.gov.tr. In restaurants in Turkey it’s common to leave 10-15% as a tip, unless service charge is included – make sure you check your bill carefully. Round up the fare when paying your taxi driver, although it’s not necessary to tip a dolmus driver. In the very popular Turkish baths, you should tip the masseuse between 10-20%. The official language of Turkey is Turkish. English is widely spoken too, so getting by is easy.